Recent incidents showing Members of the House of Lords accepting money for lobbying have increased interest in the system of so called “All Party Parliamentary Groups”. The Guardian says that corporations and outside interest groups have funnelled more than £2.2m in sponsorship, research support and freebies to MPs and peers through all-party parliamentary groups, a rise of 22% since last year. The Speaker has suspended 80 Commons security passes pending a standards committee inquiry into the all-party parliamentary groups which give these passes to lobbyists, allowing them unsupervised and regular access to much of parliament and its accompanying offices. There is an All Party Parliamentary Group for Aviation, which receives benefits from industry lobbyists. These groups allow those outside parliament to engage in informal discussion with MPs interested in a particular topic. There are concerns that these groups provide a channel for lobbyists to gain influence. 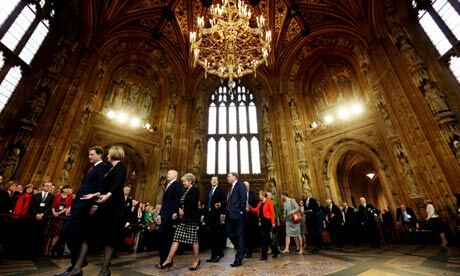 Corporations and outside interest groups have funnelled more than £2.2m in sponsorship, research support and freebies to MPs and peers through all-party parliamentary groups, a rise of 22% since last year, Guardian research reveals. Patrick Mercer was forced to resign last week after a fake lobbying firm asked him to set up an all-party parliamentary group for Fiji. The sting operation by BBC Panorama / the Daily Telegraph has once again thrust these cross-party groups under the spotlight. Late Monday, the Speaker suspended 80 Commons passes pending a standards committee inquiry into the all-party parliamentary groups (APPGs) groups which he began last year and which now has greater urgency. Today Guardian research shows that the level of sponsorship, gifts and funding from these groups has risen for the second year running. The value has increased by 22%, up from £1.8m which previous research revealed last year. The number of APPGs has also increased from 450 last year to 589 of these informal cross-party groups, each of which are listed as part of the register of MPs financial interests. • A grant of £65,000 from BT to support the parliament choir. A full list of choir members is unavailable from their public site which requires a password. • A donation of £40,000 from Barclays and £40,000 from Prudential to the Trade and Investment group. • The Internet and Communications Technology group has the largest sums at its disposal – £0.2m including donations from Google, Vodafone and BT. Chinese firm Huwei, currently being investigated by parliament’s intelligence and security committee for its relationship with BT, also donated £200,000 to the group. • £8,227 and £5,227 from Heineken and Carlsberg respectively, donated to the Beer APPG. • The ‘continence care’ all-party group receives support from theAbsorbent Hygiene Products Manufacturers Association which acts as the group’s secretariat. Peers and MPs were able to issue security passes to those working on APPGs, allowing them unsupervised and regular access to much of parliament and its accompanying offices – although this practice washalted on Tuesday after continued allegations about lobbying. Members can also expect to be invited on trips abroad, a benefit listed in eight of the groups which the Guardian looked at. These included a visit to Hong Kong for the China APPG which was paid for by the Hong Kong government as well as a visit to Nigeria, £12,500 of which was provided by Shell International. Other potential perks include travel to, dinner, and racing covered for members of the Greyhound group, and tickets to matches for members of the Rugby League APPG. These groups allow those outside parliament to engage in informal discussion with MPs interested in a particular topic. There are, however, concerns that these groups also provide a channel for lobbyists to gain influence. Guardian research identified that more than 60 (10%) of APPGs received some form of support from lobbying firms. The Skin APPG, whose purpose it is “to raise awareness of skin conditions” was one of many groups to have a consultancy firm providing its secretariat – a form of support which is not costed and therefore excluded from the total benefits received. Bellenden, a firm “specialising in political, planning and corporate communications”, whose clients include the Dispensing Doctors’ Association, oversees the £29,500 which the Skin APPG receives from various donors. The research, compiled using ScraperWiki to gather data from the official register, is the third year that the Guardian has investigated these groups. The register is automatically updated every six weeks, and covers the previous 12 months to that date (most recent update at the time of writing is 29 April 2013). Since registration of a donation can be after this has actually taken place, it should be noted that the values provided here are estimates. These new findings come as the Prime Minister faces additional pressure to deal with lobbying – an issue which he warned in 2010 would be “the next big scandal”. Downing Street announced on Monday that a bill which would create a register of lobbyists would be brought before Parliament before the summer recess next month. There is an All Party Parliamentary Group for Aviation. A Fair Tax on [sic – this should say A Fair Tax on Flying – but part has been left off. The item is obviously incomplete. A Fair Tax on Flying is an aviation lobby group, and is understood to provide administrative assistance to the All Party Group, and advice]. Laurie Price frequently chairs aviation conferences throughout the year as well as industry-sponsored fringe meetings at the autumn party conferences. At one recent aviation conference in London entitled “Does London need more runways to remain globally competitive?” or some such similar title, he took fully 15 minutes for the ‘Chairman’s opening remarks’ arguing that there was no shred of doubt that London needed more runways to remain globally competitive. Which is not the normal behaviour normally expected from someone chairing a conference. He is a dyed-in-the-wool aviation groupie – and especially a Heathrow groupie – which might just have something to do with the fact that BAA has been one of Mott Macdonald’s best customers over the years. For the third year running, the Guardian has investigated how much was donated to gatherings of MPs and Lords known as all-party parliamentary groups. With the help of ScraperWiki the Datablog has again compiled a document bringing together hundreds of separate disclosure reports from all-party parliamentary groups. Donations to APPGs amount to £2.2m, £600,000 more than when the Guardian last completed the exercise in 2012, and £800,000 more – 50% – than when it was first conducted in the first year of the coalition. • The Internet and Communications Technology group has the largest sums at its disposal – £0.2m including donations from Google, Vodafone and BT. Chinese firm Huwei,currently being investigated by parliament’s intelligence and security committee for its relationship with BT, also donated £200,000 to the group. • The ‘continence care’ all-party group receives support from the Absorbent Hygiene Products Manufacturers Association which acts as the group’s secretariat. However, as we explained last year, this does not entirely overcome issues around political transparency. Numerous entries describe how donors “meet the cost of various small dinners” or “act as the groups secretariat” – suggesting that the services which these groups benefit from may be underestimated. To be recognised by Parliament, all-party groups must be open to all Members of the House of Commons and the House of Lords. They must also include at least 10 Members from the political party in government and at least 10 who are not from the government party. Not being recognised by Parliament, and having an unofficial status may be beneficial to those who are looking to exclude the support they receive from the public register. We’ve published the full details from the register of interests below. Have you seen something interesting? If so, let us know by posting a comment, or by contacting us via Twitter at @GuardianData or @MonaChalabi. 29.8.2012A report has been produced by the All Party Parliamentary Group on Aviation, looking at the effect of APD and the economic impact of aviation in the UK. It said efforts should be made “to ensure the UK retains and grows hub capacity” at Heathrow or a new purpose-built hub airport. It is very much a report from the point of view of the aviation industry. It is important to stress that this is not a formal select committee of Parliament. It is just a group of MPs who are enthusiastic about aviation. It has no official standing. By contrast, the official Parliamentary Select Committee on Transport will start an investigation into aviation in September, and that is the report people will take seriously. One of the APPG report’s many pro-aviation-expansion recommendations is that the “Government develop a comprehensive growth strategy for aviation that addresses all “barrier” issues in a coherent and consistent manner.” With little regard to environmental constraints on growth. Posted: Wednesday, June 5th, 2013. Filed in General News, Recent News.